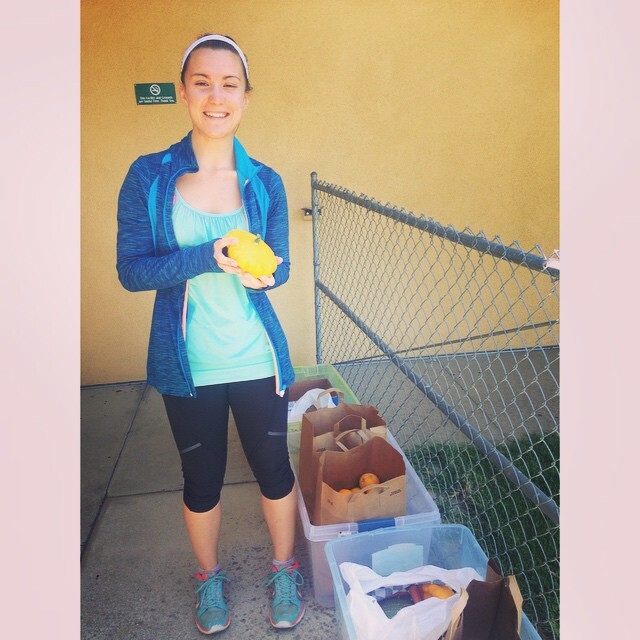 This summer, Aidan Munoz-Christian, a young leader at the Unitarian Universalist Fellowship of SLO county contacted GleanSLO about putting on a Fruit Drive with her Church. In the past, we’ve mostly worked with schools on the Fruit Drive program, so we loved the idea of expanding it to a Church. The UU Fellowship has been an incredible supporter of GleanSLO over the years. Aidan did a great job of engaging her congregation and educating others about hunger and food waste. We asked Aidan to tell us a little bit more about why she wanted to do a Fruit Drive and get involved with GleanSLO. Below is her interview. My name is Aidan Muñoz-Christian and I have lived in San Luis Obispo for fourteen years, which is the majority of my life! I was born in Maryland and have also lived in New Mexico and Southern California, but the Central Coast has been my home for the most time. I graduated from San Luis Obispo High School last year and have taken a gap year to explore my interests, travel, and volunteer before heading off to college at Saint Mary’s College of California in the Bay Area. I recently became more interested in food – in terms of where it comes from, how it gets to us, how it nourishes us, how to prepare it, and how it relates to other sectors of health and society – as part of a health and wellness lifestyle change I decided to make this year. Through this process, I have discovered I love to cook (I wouldn’t say I’m very good because I’m very new at it, but I’m learning)! It has also in part led to my work with GleanSLO. My other passions include music (both singing and listening to it), reading and writing, traveling, exercising, and learning. I love spending time with my friends, family, and pets, being outside, riding my horse, hiking, drinking tea and going on picnics! When and how did you hear about GleanSLO? What interests you about the work we do? Would love a personal story or connection about what the fruit drive means to you, and why you decided to organize it? I had been familiar with the name since about the middle of high school because someone I knew had volunteered with GleanSLO, but I didn’t completely understand what the organization does until I decided to register as a volunteer earlier this year. I have recently become interested, perplexed, and disturbed by food waste and how rampant it is in society today. Furthermore, I’m amazed and inspired by GleanSLO’s efforts to alleviate hunger in our community – which is closely tied to food waste – by making use of what nature has already provided. The fruit drive is an incredible opportunity not only for me but for everybody involved in it, because it is a way of opening up a dialogue about food justice. My hope is that this in turn will lead to more awareness of these prevalent issues, which is the only way that change can gradually be effected. I am a member of the Unitarian Universalist Fellowship of San Luis Obispo County and started this fruit drive as part of the Spiritual Activist Leadership Training I’m participating in, which is a program for young adult Unitarian Universalists seeking social justice. The fruit drive is my individual project, which is a major component of this program. This is where we choose an area of social justice that we feel passionate about – mine being food justice – and then pursue a project to connect our congregations with our community. This, of course, is where my work with GleanSLO comes in! We’d love to know about the other work you’ve done through the UU or other community involvement. Anything that inspires you to be involved and give back to the community? It has really been this year that I’ve become involved in the community and in matters of social justice. I wish I had started earlier, because there’s so much I want to do! I joined the Social Justice committee at the UU Fellowship, where they are currently working on issues of environmental justice, race equality, and income inequality, among others. My faith inspires me to be involved and give back to the community, as a core component of Unitarian Universalism is social justice, fueled by the belief in the inherent worth and dignity of every person. I am also motivated to give back from my place of privilege: I feel that it is my duty to serve and engage with those who have less than I do. Also, I am compelled to give back to this community which has nurtured me for the past decade and a half. I have learned and grown so much here and it’s the least I can do to say thank you! What did you learn from organizing this fruit drive? Has anything been surprising as you’ve learned about food access and hunger through this process? I have learned a great deal from this experience. For starters, it’s made me realize just how much work goes into planning an event that from the outside may look simple, and it’s been a test of my leadership and organization skills. I’ve also discovered that I have a passion for food justice and this is something I hope to further pursue. I am surprised by how many people have abundant produce in their yards! Over the span of two Sundays, we collected 205 pounds of fruits and veggies, and that was only from the people who donated in this congregation of less than 200 members! I can only imagine what the rest of the community is like! Probably the most impactful lesson I’ve learned is that hunger is a solvable problem. The real problem is food waste and distribution, which is causing millions of people to go hungry. In the US alone, 40% of all food grown and produced is wasted, not to mention worldwide, where a third of all food produced goes to waste. This is a startling truth we must face. There is something all of us can be doing right here and now to eliminate this epidemic. It is reassuring to know that there are organizations like GleanSLO making strides to do this; creating new systems of connection where there were none before. If only the rest of the world would follow suit. Any favorite fruit/veggie recipe or how you like to eat your local fruits and veggies? Resources, cooking or healthy recipe ideas? Oh, where to begin! I knew this question would be a tough one, because I could go on and on. But I’ll try my best to keep it simple. First off, I am a huge fan of farmers’ markets, as are many people involved in GleanSLO. My family and I go every week and it is quite an event for us. We get nearly all of our produce at the markets and it’s always such an adventure to see what we can create from it. (I’m really excited for the San Luis Obispo Farmers’ Market Cookbook to come out!) It’s also so rewarding (and delicious!) to know that almost all of your meal was made from fresh, local fruits and veggies, and that you are not only consuming nutritious food but that you are supporting local farmers whom you know personally while you’re at it. In all honesty, I actually hated vegetables until this year. When I decided to start eating healthier, I realized there was no way around vegetables. And I can tell you that I have learned to love them. So to all those vegetable haters out there; to all those picky kids, it is possible to change! The key is to find interesting ways to prepare them, which is something I’ve set my mind to this year. There are so many great recipes out there, and I’m constantly trying them out and looking for new ones. But I’ve also learned that cooking is a process of experimentation – it can be kind of intimidating at first to stand in your kitchen staring at a counter covered in veggies without any kind of written instructions to prepare them, but you become more fearless with practice (lots of trial and error…). I love whipping up stir fry, salads, wraps, pasta dishes, soups, frittatas, sautéing veggies for fajitas, roasting them in the oven, putting them out on the grill, and incorporating them into healthier spins of Mexican and Tex-Mex dishes. As for fruit, I’m basically addicted to it and will eat it anytime and anywhere, without much preparation. Below are some of my favorite simple and healthy ways to enjoy fresh produce. Mixed farmers’ market greens, chopped tomato, sliced avocado, garbanzo beans, roasted corn, and sliced almonds, dressed with balsamic vinaigrette. Arugula, spinach, sliced strawberries, blueberries, sliced Granny Smith apples, crumbled goat cheese, and walnuts, dressed with vinaigrette of choice. Toasted whole grain bread, hummus, avocado, and sliced tomato, topped with microgreens. Avocadoes are my absolute favorite, so I’m always looking for new ways to prepare and eat them. I’m currently enjoying halving them and baking them in the oven with an egg in the middle, then adding a sprinkle of salt and pepper. Also, they make a powerful, nutrient-dense smoothie when blended with a banana, plain Greek yogurt, orange juice, and a touch of ginger. Finally, a great resource is MyFitnessPal. They have bottomless archives of healthy recipes packed with fruits and veggies, and some of my favorites have come from there. It’s an app, but they have a website (myfitnesspal.com) and all recipes can be accessed online. Happy Cooking and Happy Eating! This entry was posted in Uncategorized on 09/11/2015 by gleanslo.